Kim Brooks is a graduate of the Iowa Writers' Workshop, where she was a Teaching-Writing Fellow. Her fiction has appeared in Glimmer Train, One Story, The Missouri Review, and other journals, and her essays have appeared in Salon, Buzzfeed, New York Magazine, LennyLetter, and on WNYC’s Note to Self. Her debut novel, The Houseguest, was published in 2016 by Counterpoint Press. Her memoir, Small Animals, is published by Flatiron Books. Brooks lives in Chicago with her family. "Small Animals is one of the most important parenting books of our generation--and a gripping read besides. At the book's heart is a harrowing story, beautifully told. But Kim Brooks goes beyond her own experience, weaving together reporting, social criticism, and personal narrative to create a troubling portrait of a nation driven mad with worry." "Everyone tells you parenthood will change you for the better. But few parents describe how the current, high-strung culture of parenting can erode your confidence, feed your worst impulses, and force you back into some regressive, second-guessing state you haven't experienced since you were a preteen. 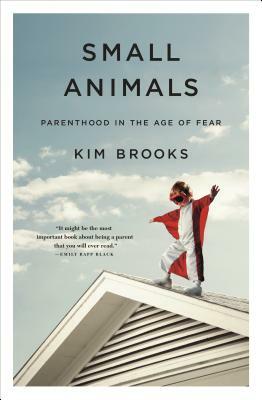 Kim Brooks offers an engrossing, insightful examination of the countless absurdities, identity crises, and obnoxious obstacles that come with raising children at a time when wisdom and perspective are the rarest qualities around. Small Animals is a beautifully told, harrowing story with a clear moral that all parents should take to heart: This job is very hard. Forgive yourself." "One otherwise ordinary day, Kim Brooks found herself accused, by virtue of a parking-lot stranger's cell-phone surveillance, of being a criminally negligent parent. The story of what followed, smoothly interspersed with cultural reflections, anecdotes, and bracingly honest, often droll, introspection, is both a can't-put-it-down narrative and a sharp diagnosis of the fears, guilt, and costs to both parents and children of the contemporary fixation on keeping kids safe. Written in a voice that is crisp and unpretentious but dives deep, Small Animals is a pleasure both to read as a memoir and to mull over for its cultural insights." "Kim Brooks is a great storyteller. She has seamlessly woven together journalism and personal narrative to form a book that is the perfect antidote to our culture of over-parenting — a book that is calming but also alarming, because it shows how far we’ve gone off the tracks. Any mother or father who is currently sipping and self-medicating and endlessly Googling their way through the fear factory of early parenthood must read Small Animals. It will give them something those other fixes cannot offer: necessary perspective." "Part memoir, part history, part documentary, part impassioned manifesto, Small Animals is a genius alchemy of the personal and the political, the mirco and the macro, the social and the historical, in a time when parenting has become saturated with fear and outlandish expectations for parents and children alike. Brooks uses her innate curiosity to unpack why and how parenting has become, in many cultures, an Olympics of achievement and a way of proving one's 'goodness.' Although Small Animals is far too wise and gorgeous to be a parenting book, it might be the most important book about being a parent that you will ever read." "Why have we become so fearful as parents? When did parenthood become a minefield of insecurity and shame? With humor, heart, and intelligence, Kim Brooks explores these issues using her own deeply personal story." Small Animals is a funny, empathetic, and eloquent report from deep inside the bunker of our national anxiety disorder. Profoundly thoughtful and richly detailed, it shows us how we got here and offers moms and dads some guidance, as well as some moral support, as to how it might be possible to find a way out of our self-inflicted reign of terror.